Research-time for NEW 2019 music and action project. What's it all about?... Images and details here soon! Try making words from letters A-G on the musical scale. "Caged" and 'Façade" are my favourites...but there are funny ones like "cabbage" and "egg". Now make a tune or song out of these words...or a dance, or a poem or story. Or a work of Art. That's we did throughout Art on the Hill weekend 2017 at Victoria Park Baptist Church, Bristol. 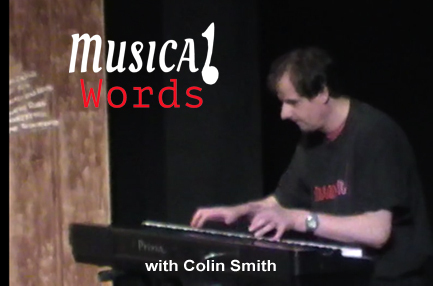 On the Saturday, pianistic improviser Colin Smith enhanced our multi-arts experience. **HERE** is our Musical Words A-G community collage, now installed in the Charles Padfield Centre, BS3 5DA. Why 'Thoughts And Earworms'.....? Here is the background story behind this exciting new multi-arts venture for Primary School-aged children - and adults as well. This wellbeing-enhancing multi-arts project is funded by CASS Bristol via Bristol City Council. All c/o Victoria Park Baptist Church, Bristol BS3. A series of workshops rooted in tunes and lyrics that have the power to inspire and unite people of all ages. Our latest gyroscopic multi-arts creations are all song-based. This is an old multi-arts project. Created WAY before YouTube came into being. At a time when I'd recently trained in graphic design and loved experimenting. Thank you to Richard Stubbings for the *soundtrack* - it's a gem. Well...Autumn term is here and the British Hedgehog Preservation Society britishhedgehogs.org.uk is sharing this piece. Thank you! Whether by word, music or image...let's spread awareness of hedgehogs - their numbers are declining and it's serious. GYROSCOPIC has been working on two projects these last few months: "The Owl And The Pussycat" workshop...a telling of the poem with a Bossa Nova lilt. There's more about this HERE. ALSO, a new venture: A Music And Dance Funday! A skill-building day on 30th August this year for Primary school aged children. We'll be helped along by the Pentatonic Scale...the happy musical scale where it's impossible to play a wrong note - try it: There's an example HERE. 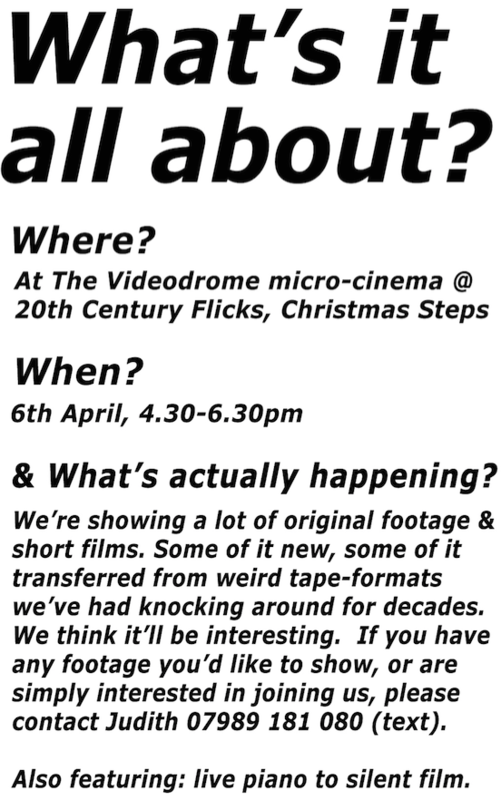 Also we'll build our own simple piece of choreography to show the grown ups at the end of the day. Pandora: Our latest multi-arts workshop - music, dance, storytelling, visual art - now adapted for KS1 and KS2 children. We look forward to sharing this new interactive re-telling of 'Pandora's Box' with Primary schools in Bristol in 2016. Here is a glimpse of the piece in rehearsal. Further information & logisitics relating to our Pandora workshop can be found here. This is our piece for Bristol's Big Green Week 2015. A multi-arts workshop event, telling our environmentally apt story in words, music, song and movement. 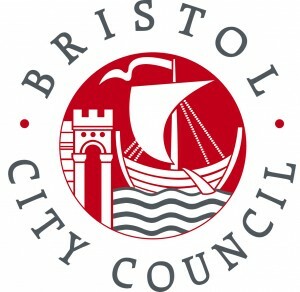 We're excited to be part of Big Green Week during Bristol's year as International Green Capital. 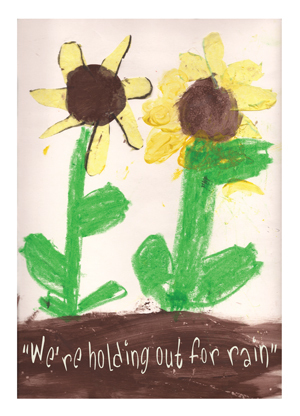 July 17th 2015: We have also now completed a whole series of Primary school "Holding Out For Rain" workshops. Here is our most recent Feedback and here is a newspaper article about us. And here's a 12 minute soundtrack mix, helped by St George Primary School. 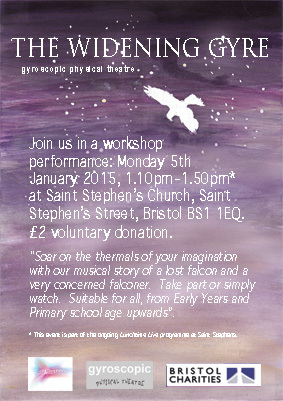 "Soar with us on the thermals of your imagination"
Video Extracts of our multi-arts workshop with a watery theme. Sing along to our "Deep Water" song at 1'25"
Update 2015: A series of successful school workshops and a slot at Big Green Week 2014. We now have a polished piece with a strongly environmental theme. "15 minutes of fame shared with 100 others...that's democracy"
Such a great project. The filming, in front of a live audience, was a performance in itself. Australia's Back To Back Theatre took just a few days to produce this celebratory film, featuring some 100 artists. The entire piece can now be viewed online (left). Have a look - it's intriguing. Our contribution begins at 4'44". "Break old habits and find new ways of moving..."
"A new system I'm developing combining guided imagery - e.g. imagining moving through water: resistance, buoyancy, fluidity - with forms similar to Yoga asanas. Though its core lies in contemporary dance, I am calling this "movement meditation". I have now been resident at Saint Stephens for one year and I continue to hold movement workshops in this inspiring and evolving space in the heart of Bristol". A workshop performance with Kathleen Downie and Judith Jarvis at Saint Stephens for Bristol Doors Open Day. "We made this piece in Berlin - the choreography here is quite stylised for the sake of the film...but actually very simple and good for the shoulders. I think anyone can learn similar moves, so please come and join us! I will be running sessions in Bristol, UK, for small groups. If you're interested in finding out more please contact judith@gyroscopic.org." This piece was first shown at 'Summer Arts Encounter' at Saint Stephens, Bristol . We were then asked to perform INSIGHT at 'Practice - Made in Somerset', a national conference, sponsored by the Arts Council England, held in September at the Merlin Theatre, Frome. 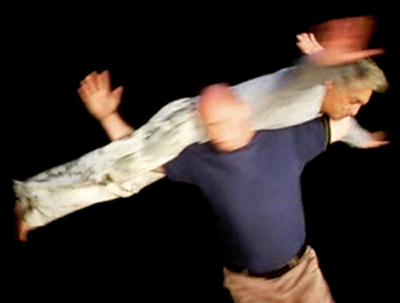 Timelines: With David Stevens and Gregory Champion, choreographed by Judith Jarvis. A hybrid of physical theatre, contemporary dance, performance art...This piece was commissioned for UNESCO day 2008 to commemorate the abolition of the slave trade. It was premiered at Saint Stephens, Bristol UK. With thanks to Bristol Dance Centre. Judith adds in 2009: A shortened version of this video was entered into the 2009 Sadlers Wells Global Dance Contest - a truly global event. Our video entry made it into the final thirty! Fresh from performing at the Bristol Harbour Festival, alongside the principal dancers of the Martha Graham Dance Company, New York, Greg and David make their mark in the historic atmosphere of Saint Stephens, Bristol, UK. Their stark, post-modern performance "TIMELINES", cuts a striking contrast against the backdrop of ecclesiastical paraphernalia. This piece, by Judith Jarvis, was commissioned for the UNESCO Abolition of Slavery Day, 23 August 2008. 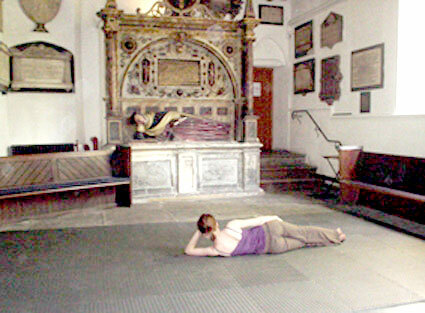 It was performed again, throughout the Bristol Doors Open Day, on 13 September 2008..
We're in the process of developing dance and physical theatre at Saint Stephens in the centre of Bristol, UK. Our view is to continue using this space for both workshops and performance. For further information please contact judith@gyroscopic.org. 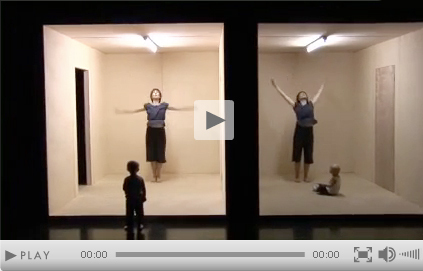 Judith has posted some further fragments of choreography onto YouTube (see left). "I find it useful to document sections of choreography using video. Like a visual diary it logs thoughts and details that would otherwise be forgotten. Video also allows me to see where I'm going wrong - it's really not very forgiving. I generally then edit out the bad bits..."
This material was used in a performance in December 2007, Bristol UK, with Jackie Haynes and Richard Jones. "Nichtigkeit" means voidness, nullity, inanity. "Ewigkeit" means eternity. "The wind blows where it pleases. You hear its sound, but you cannot tell where it comes from or where it is going..."
I put together and used this GarageBand soundtrack in Herrnhut, near the German/Czech border where I was running a youth dance project. There's a deep sub-bass on this track and you'll need a good sound system! Judith in Berlin, Germany discussing some recent work. 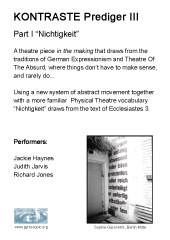 Judith introduces a small section of a study based on the wisdom and paradoxes of Ecclesiastes 3, upon which she based a recent dance workshop at Hofkirche, Köpenick, Berlin. DANCE IN BERLIN. People have asked me about open professional classes in Berlin: The 4 places I am familiar with are Dock 11 - for Ballet and Contemporary training, also with its own theatre; Marameo - which has a sizeable studio which doubles as a performance space for work in progress; Tanzfabrik - a hothouse for innovative dance which offers an intensive training programme over several months, as well as daily professional Contemporary dance classes; also Studio LaborGras for daily classes, regular productions and research projects. I updated the above information on 28.06.2010. All the above studios have sites giving further information. We designed this flyer to publicise our dance workshops and our recent dance performance in Bristol, UK. 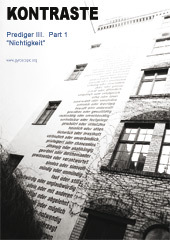 The flyer features a building in Sophie-Gips-Höfe, in the Mitte district of Berlin. Along one wall of this Altbau house runs a long list of antonyms - words of contrast. A very big "thank you", by the way, to Geoff Hall, who runs the 'Arts Mentoring Group' in Bristol.